The second book of Molly O’Keefe’s Boys of Bishop series, Never Been Kissed (pre-order now for release on July 1st), is an intensely personal journey of two very different people helping each other find love. When the book starts out, the heroine has been kidnapped by pirates. The hero rushes to her rescue, arriving in time to save her from both the pirates and her scary political mother. On the face of it, it’s a pretty crazy premise for someone like me who’s never been the least bit tempted by romantic suspense. Luckily, the story comes back down to earth very quickly. When Ashley Montgomery and Brody Baxter arrive in Brody’s adoptive hometown of Bishop, Arkansas to allow Ashley recuperate out of the both the public eye and the not-so-nurturing bosom of her wealthy, political family, any hints of suspense fly out the window. The story becomes a journey of healing. Ashley has already been dismantled by her kidnapping and the subsequent less than supportive reaction of her family. Brody has never fit in anywhere or been close to anyone, having been adopted shortly before a difficult moment in his adoptive family’s history. He’s not used to relying on anyone or have them rely upon him but for the most concrete needs: money, personal safety, physical labor. Add in the fact that Brody and a young Ashley had met before when he was a bodyguard for her family and the tension in this book is off the charts. I struggled with the emotion here because it was just so believable. O’Keefe doesn’t allow the reader any distance. There is a subplot that eases the dramatic tension somewhat, but I’ll get to that in a moment. I’m not a crier by nature, but I felt so badly for these characters at one point in the story that tears were inevitable. Ashley and Brody both have such tremendous personal pain and so many defensive layers built up around their psychological wounds that they have become more like thick scar tissue. And in true small town romance fashion, it takes a village to help them work through that and bring them together. Brody’s strained relationships with his father and brother are as much a part of his healing as his relationship with Ashley. And Ashley finds a context for her life independent from her high profile family through her interactions with Brody’s dad. There is so much need in this book for love and forgiveness: Brody and Ashley, Ashley and her family, Brody and his family. And the fact that all of these relationships experience redemption I think is what kept this book from being depressing. I’m not normally a lover of angst in my romance, but when the problems are as common and real as the ones these characters experience, it made my heart happy to see them work through it. Like, Wild Child , the first book in this series, Never Been Kissed is one of my very few five star contemporary romance reads. I’m looking forward to more from Molly O’Keefe. As a foil to Ashley and Brody’s relationship, Brody’s brother and bar owner Sean and diner owner and chef extraordinaire Cora have a much less fraught romantic road to travel. In this sweet subplot, Sean and Cora have set each other up as rivals for the past year, sniping at each other instead of working together to improve the Main Street business scene of their tiny downtown. Cora agrees to teach Sean how to cook, taking his chili from inedible to delectable. And it’s not surprising that they discover their mutual attraction in the process. 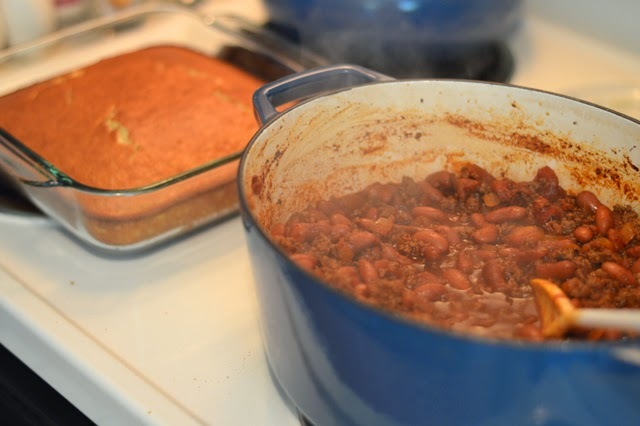 This chili and I were fast friends when I worked in an office, commuted two hours in awful DC traffic and still had to cook dinner. It takes about 40 minutes total, most of which is hands-off so you even have time to bake cornbread if you’re so inclined. Not quite the all-day brisket affair I imagine Cora undertaking, but it’s nice to have recipes like this in your back pocket for busy weeknights. Nowadays I make this for game nights with our friends. 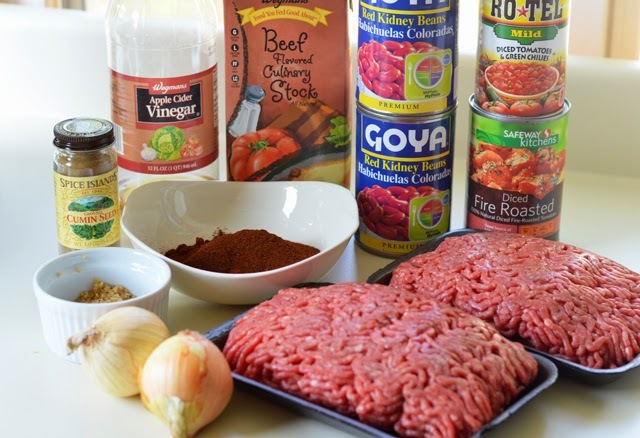 We have a few friends who aren’t big into spicy food so for them I scale back to 1/3 cup of chili powder and use 2 cans of fire-roasted tomatoes instead of adding a can of Rotel. Just those simple substitutions mellow it out a lot. 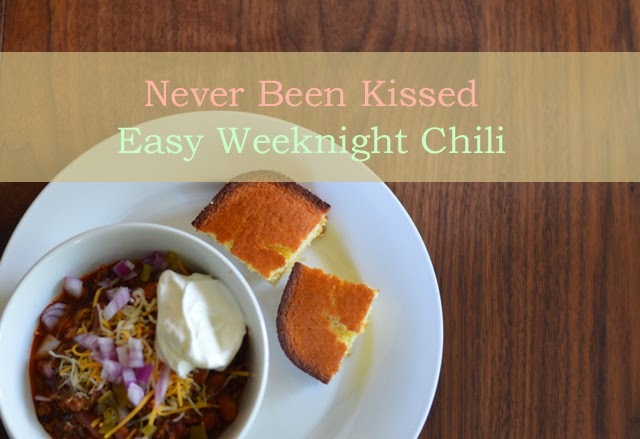 Since this isn’t your typical simmer-all-day chili recipe and it’s not as complex flavor-wise, you shouldn’t skimp on the toppings here. I like to serve it with sour cream, shredded Cheddar cheese, diced raw onion and diced jalapeño peppers. 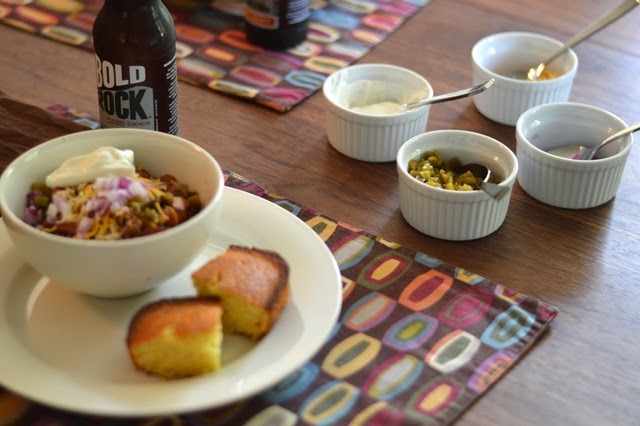 As for the corn bread, I may live in the South now, but I’m a California girl at heart. So crisp, salty Southern style corn bread doesn’t really work for me. This is a fluffy, cakey, Northern-style corn bread. Dish chili over it, crumble it up and put it on top or just spread it with butter and honey. 1) Place a large Dutch oven or saucepan over medium-high heat. Add the beef and cook until browned, about 5 minutes. 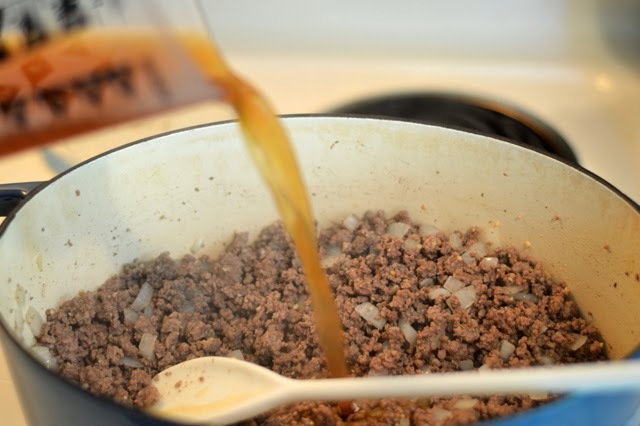 Drain off any fat and return beef to the pan. 2) Add the onion, stirring well, and cook until translucent, 3 to 5 minutes. Add the garlic and cook for 1 minute more. 3) Gradually add the broth, scraping up any browned bits from the bottom of the Dutch oven; bring to a boil. 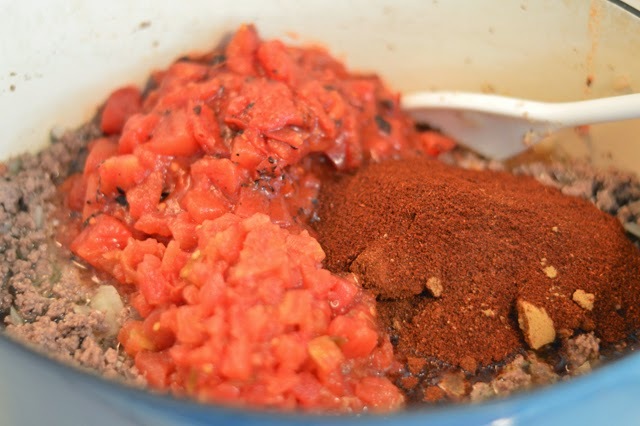 Stir in the chili powder, cumin, Rotel and tomatoes. Reduce heat to medium-low, cover, and let simmer for 10 minutes. 4) Add the beans, salt, and vinegar, stirring well. Simmer uncovered for 10 minutes more. Season to taste with additional salt and pepper, if desired. 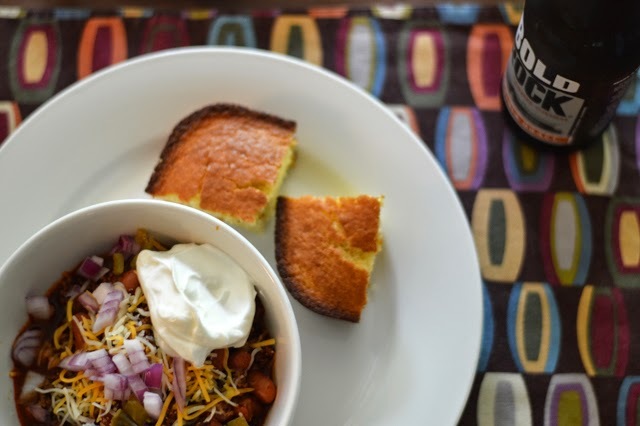 5) Serve with the Cheddar, sour cream, jalapeño, and cornbread (recipe below). 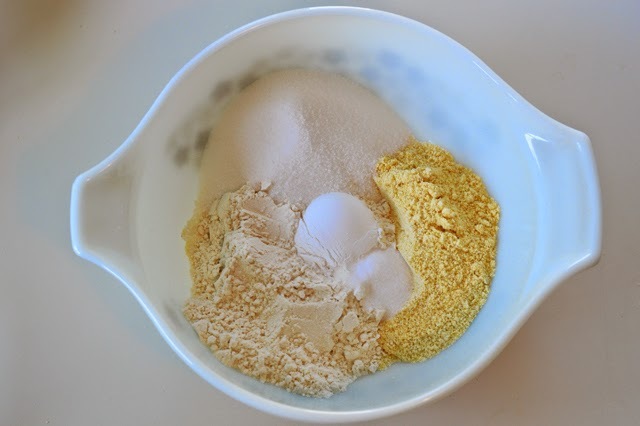 2) Combine corn meal, flour, sugar, baking powder and salt in a medium size bowl. 3) Combine oil, milk and eggs and whisk until combined. Add the wet ingredients to the dry ingredients and mix until just incorporated. 4) Spray a 9x9x2 inch pan with vegetable spray and add batter to pan. 5) Bake for 20 to 25 minutes or until a toothpick inserted in the cornbread comes out with just a few crumbs attached. 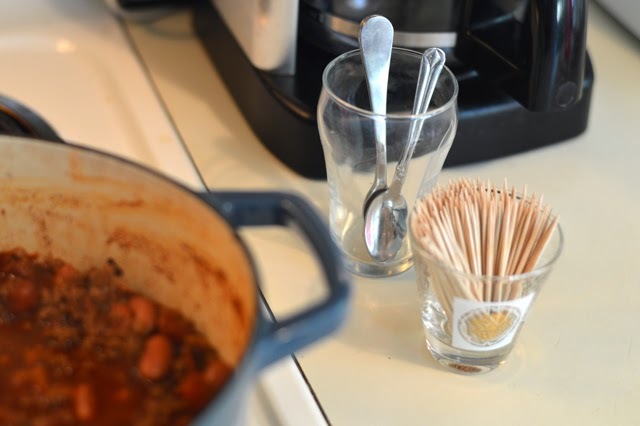 I keep baby spoons and toothpicks right by the stove for tasting and testing.